I love when I can use a torch to make dessert. I think it makes it taste at least 50% better, plus you look like a boss when you have a giant flame in your hands. 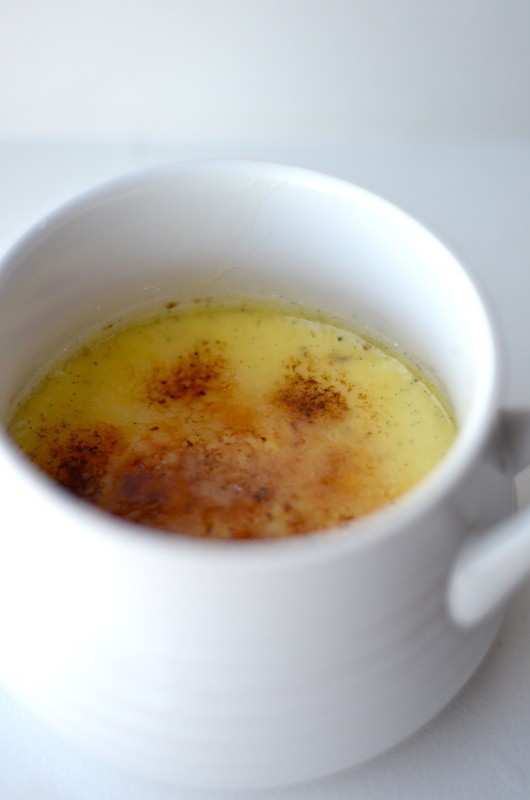 This vanilla bean creme brulee was sooooooooooooooooo good and actually super easy to make! 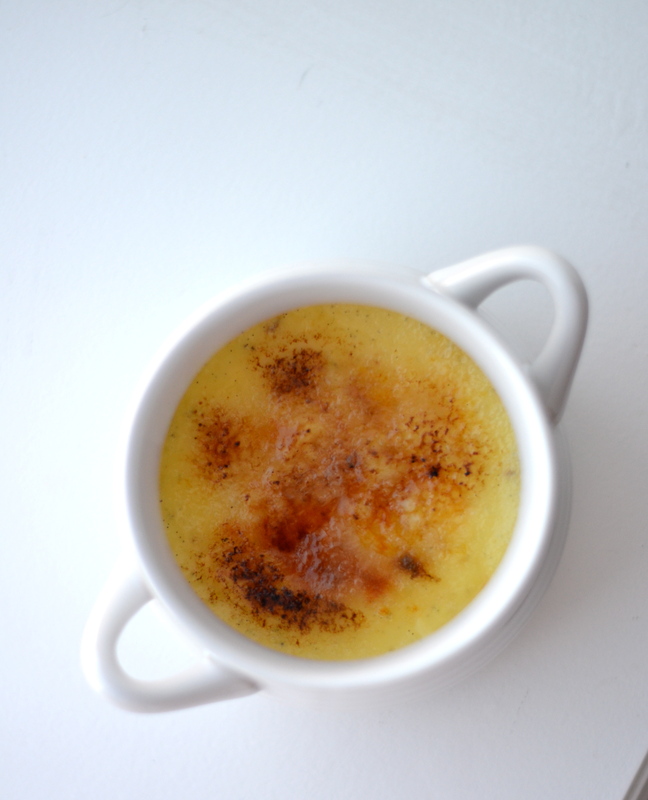 I was never a big creme brulee fan until a couple years ago. Mikey loveeeeeeeeeeeeees it and so we started ordering it for dessert and now I am obsessed. 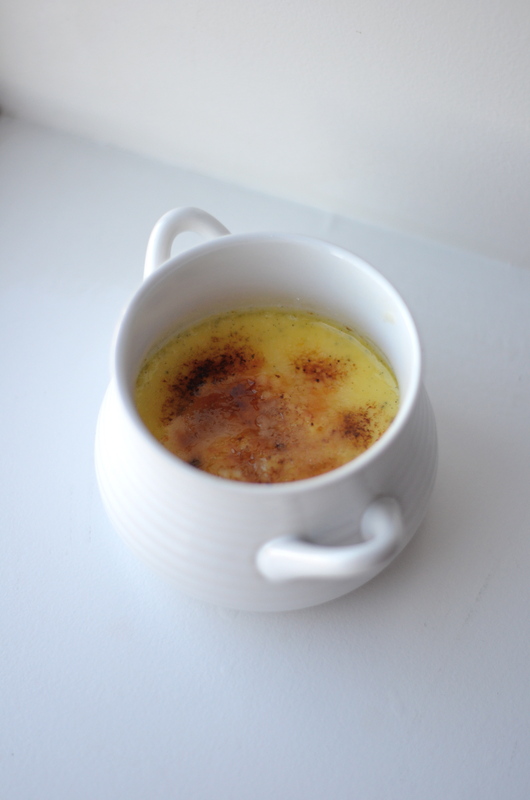 I actually made this brulee back in February and have waited until this moment to share the sweet, vanilla beany, creamy amazingness that is this creme brulee. It’s so good I just made up a bunch of adjectives for it. Just look at those specks of vanilla beans and that crunchy sugar crust. 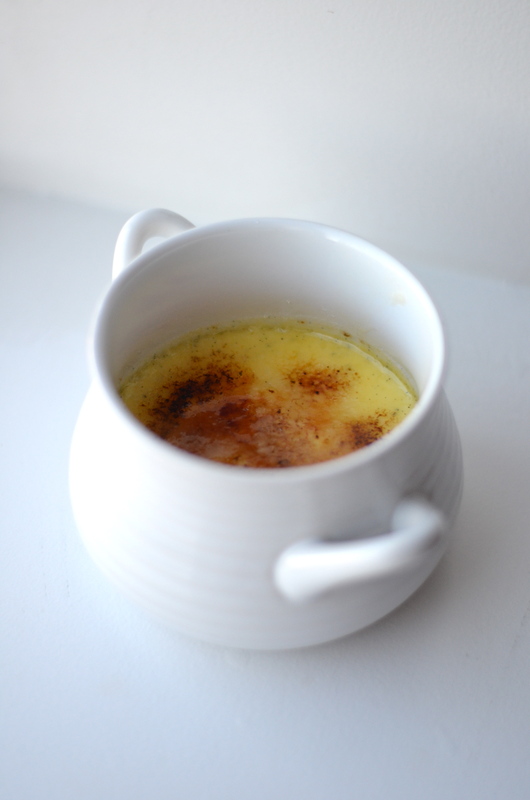 One thing I’ve discovered about creme brulee too is that it tastes great no matter what season it is. 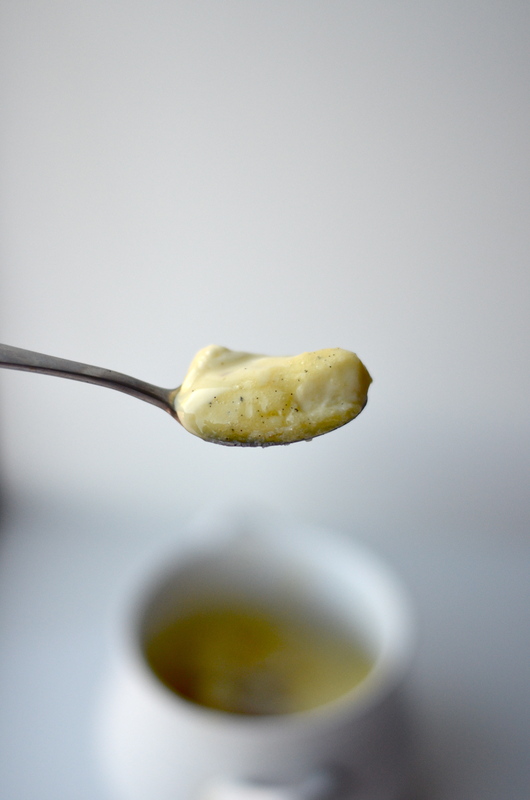 You can amp it up depending on the season and make it refreshing or decadent. You can add fruit to it in the summer and you can add spices to it in the fall and winter. It’s such a delicious and light dessert that will always impress your guests (or your cat and husband). Norman was almost as big of a fan as Mikey. 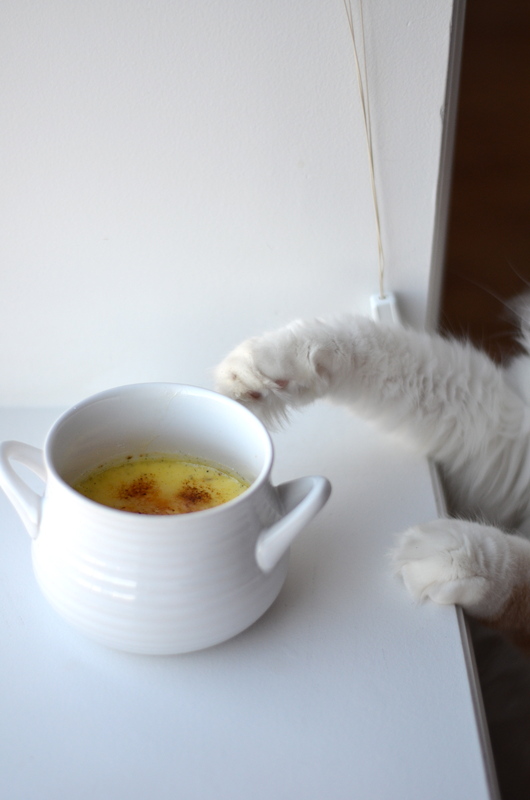 He got is paw into one of the ramekins at one point and spent the next hour in heaven as he thoroughly cleaned his paw. I am so glad that we have finally started to warm up here in Chicago! Mikey and I came home to no snow in the city (aside from a couple snowbank piles here and there) and it was the greatest sight! I am looking forward to the weekend and celebrating St. Patrick’s day with some friends! 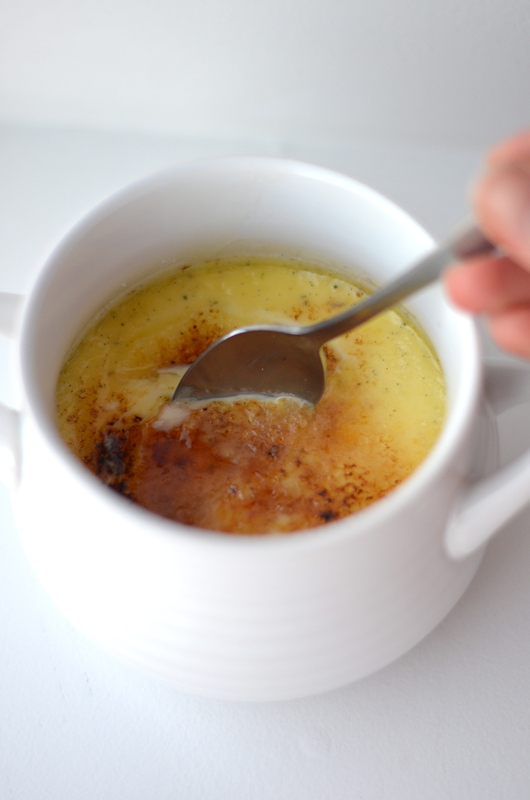 You could absolutely make this creme brulee green with a couple drops of food coloring! Whatever festivities you are looking forward to this weekend, I hope you have a great time and enjoy the warmer weather! Put cream, vanilla bean and scraped seeds into a medium saucepan over medium heat and bring to a boil. 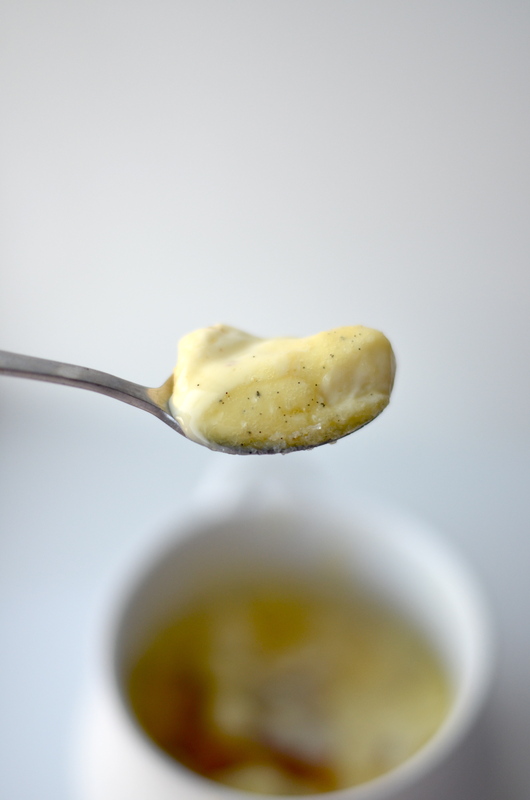 Remove the vanilla bean and save for a later use or discard. 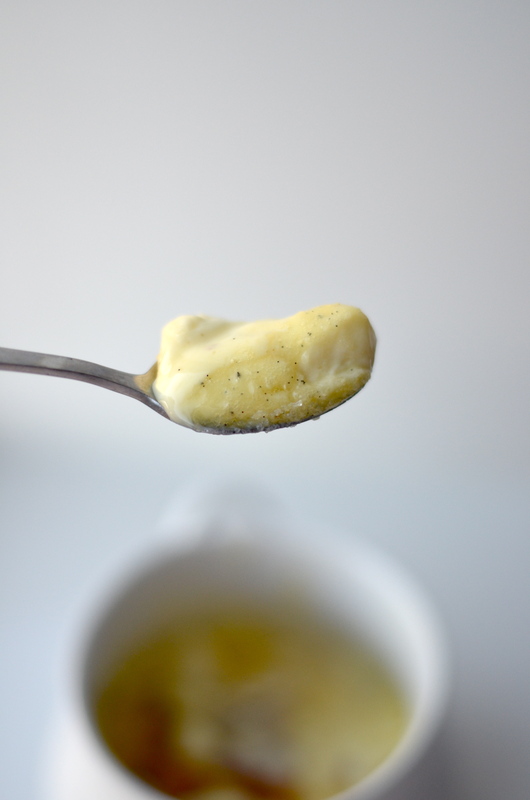 In a medium bowl, whisk together 1/2 cup sugar and egg yolks. Whisk very well until they are completely blended and color begins to lighten to a light yellow color. Add the cream, a little at a time making sure to whisk constantly so you don’t curdle the eggs. 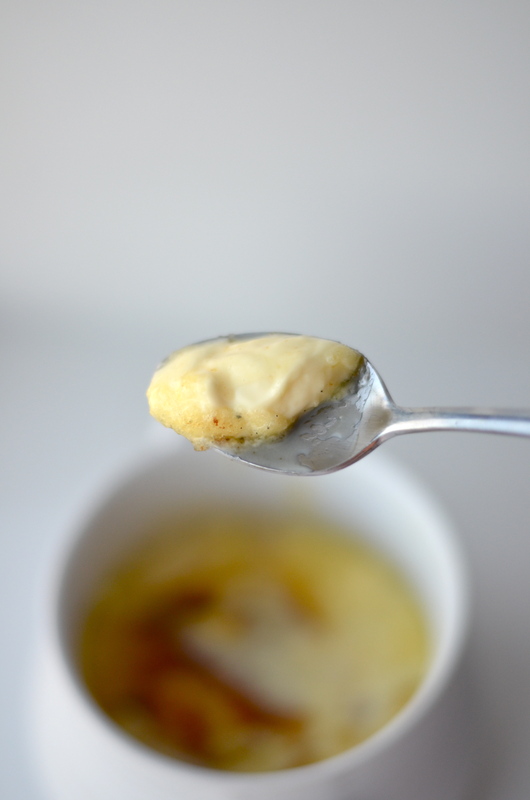 Pour the egg mixture into your 6 (7-8oz) ramekins. Take a large roasting or cake pan and place a tea towel or hand towel on the bottom. Place your ramekins evenly into the roasting pan and pour water into the pan until it reaches about halfway up the sides of the ramekins. 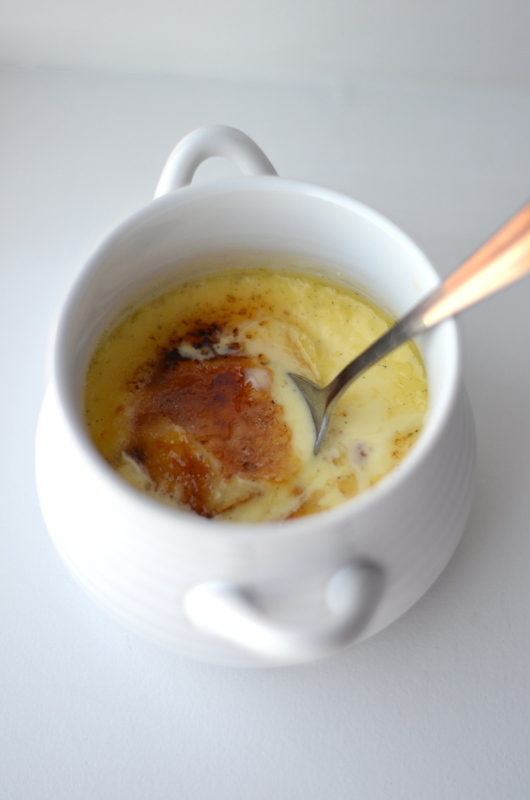 Bake for about 40-45 minute or until the brulee is set. It should still tremble a bit in the center. 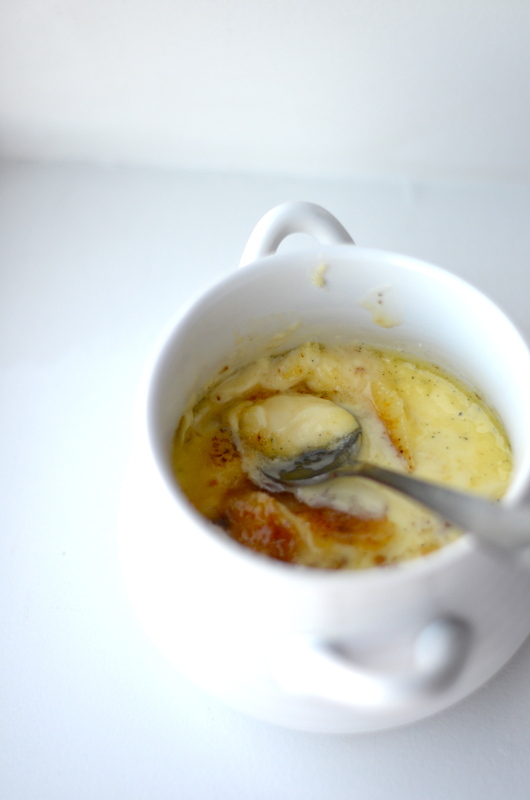 Let the ramekins cool and then refrigerate them for at least 2 hours (up to 3 days) before serving. Once ready to serve. Remove from refrigerator for at least 30 minutes before browning with sugar. 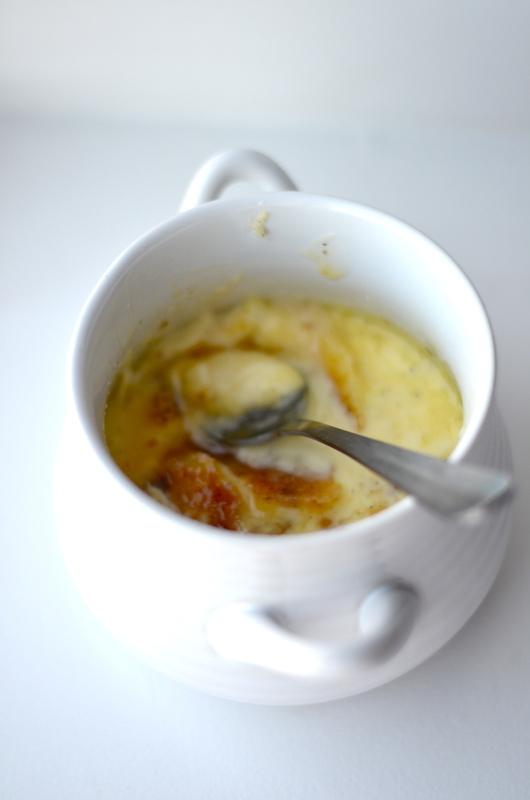 Sprinkle with remaining 1/2 cup of sugar over the 6 ramekins. Using a torch, melt the sugar until it bubbles and becomes crispy on top. Let sit for about 5 more minutes and then serve with a spoon and enjoy! I’m pinning this because I’m making this when the sun comes up! ❀ Thank you for sharing.